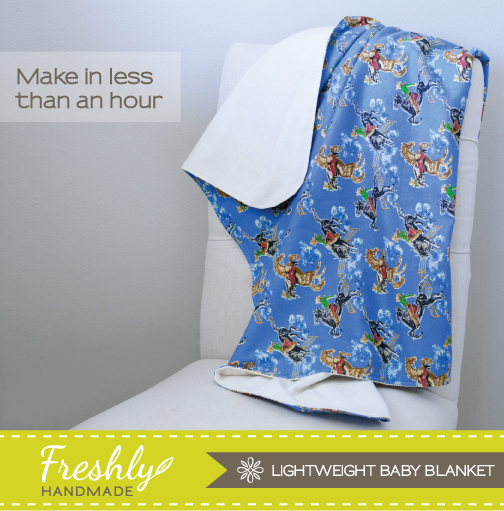 This lightweight, yet cozy blanket will make any little one feel comfortable, especially during warmer seasons when a heavier weight blanket is just too much. 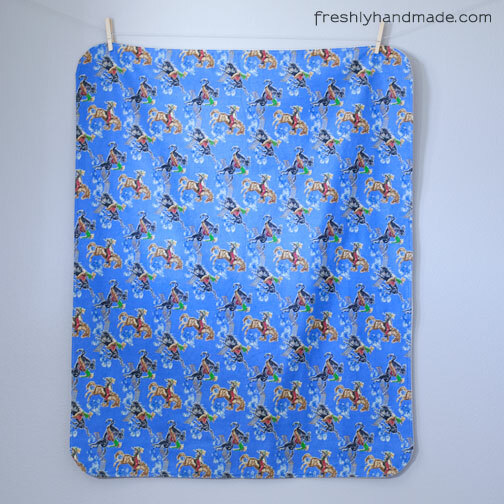 This blanket measures approximately 34" x 40" and is great for a play mat, for rides in the stroller or for nap time. 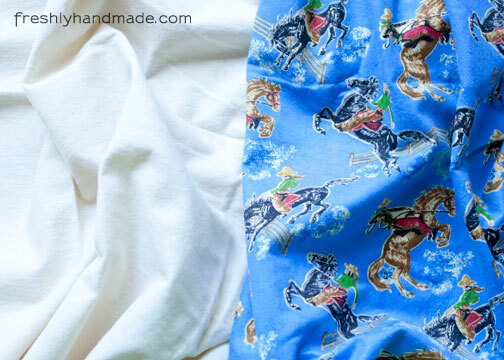 1 yard each of two different coordinating fabrics, 42" wide. 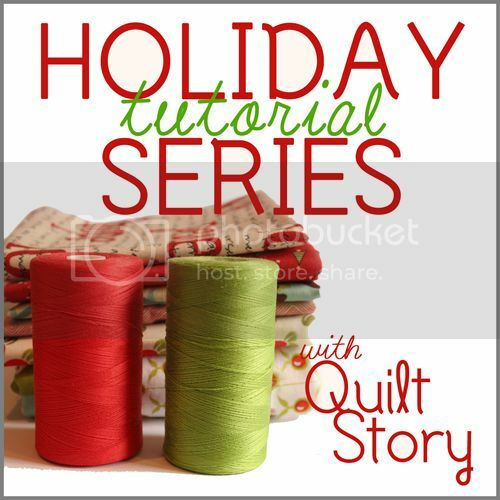 I chose lightweight flannel for both of my fabrics to give it extra softness on both sides, but you can also pair a quilter's cotton with a flannel as well. 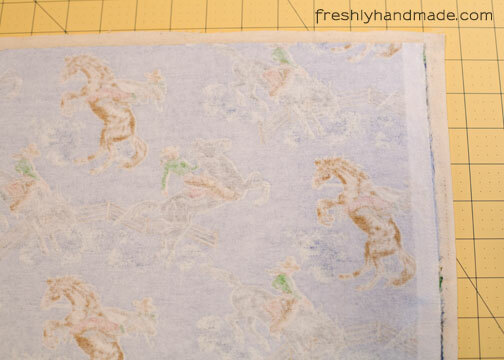 Here are the two fabrics that I used. 1. Iron both pieces of fabric and lay them flat with right sides together. 2. 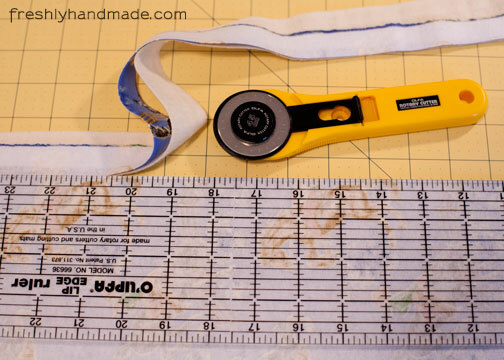 Trim the fabric even on all sides using a clear cutting ruler and rotary cutter. 3. 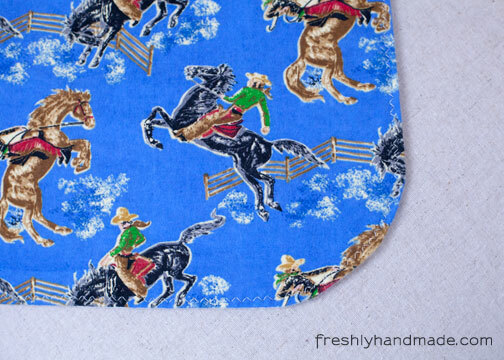 Pin both pieces of fabric together at the edge on all four sides. Leave the about 6" or so at each corner unpinned. 4. 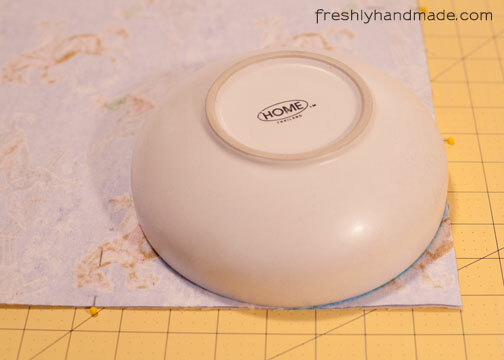 Using a medium-sized bowl, mark for a rounded edge on all four corners. 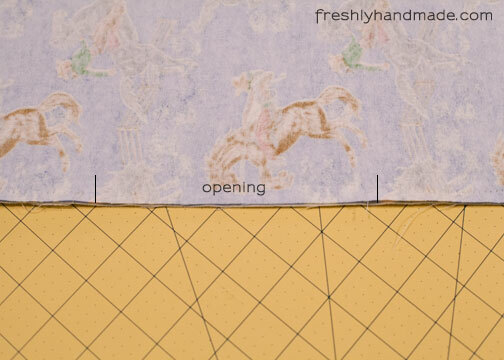 If you prefer squared off corners, skip this step and pin the rest of the way around the edge. 5. 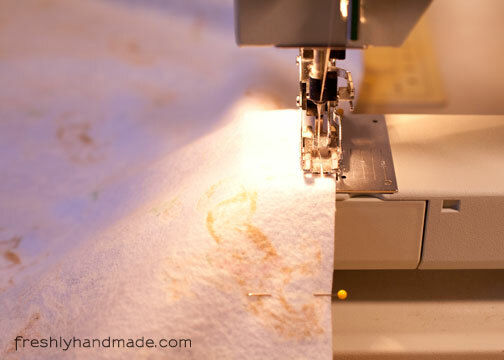 Using a scissors, cut along the curved line and pin the fabric together at the corner. 6. Straight stitch a 1/4" seam around the outer edge of the fabric, leaving a 6" opening. Backstitch at both the beginning and end to secure the stitches. 7. 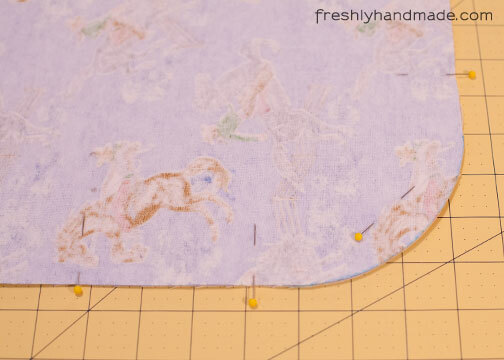 Using a scissors, clip the rounded corners with V-shaped snips, as shown below, to prevent the fabric from bunching when you turn it right side out. Make sure not to get too close to the stitches. 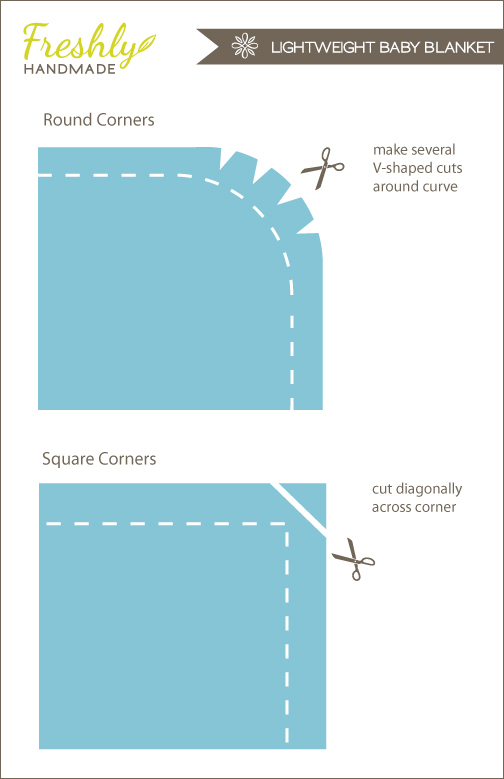 If you want the corners to be squared off, simply make a diagonal cut at the corner. 8. Turn your blanket right side out through the opening. 9. Iron the seams flat. 10. 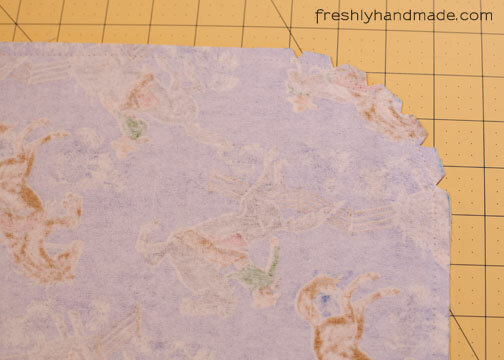 For the opening, fold the raw edges into the blanket and iron flat. You may want to pin the opening as well. 11. 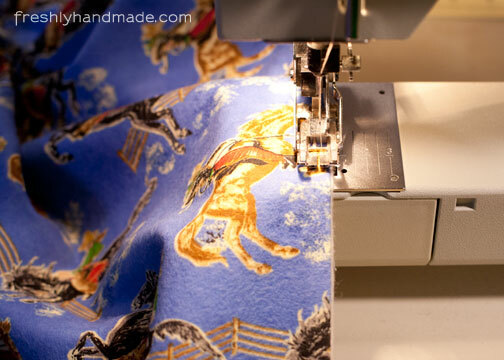 Using a zig-zag stitch on your sewing machine, sew at the edge around the entire blanket. Backstitch at the beginning and end to secure the stitches. 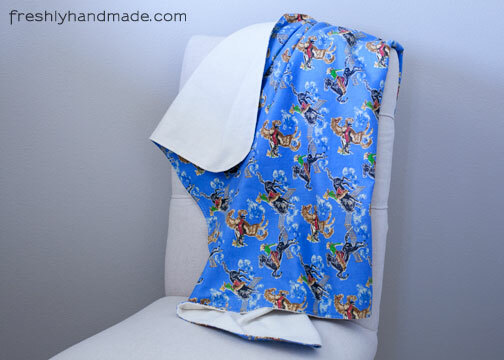 I have made about 50 of these blankets....they are great gifts for baby showers, toddler birthdays. So quick and they really are a great blanket. Do the 2 materials stay together or do they pull away from each other? 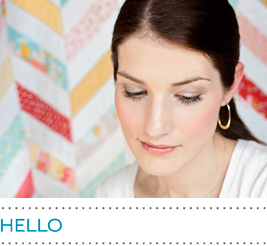 Gail - you can stitch through the centers of the blanket to prevent the layers from pulling apart. Made it, took me half an hour and all done! I let the mother was it and hope she likes it! And it does not pull from anywhere! Thank you for the pattern! !